China’s Defence Ministry announced  on 28 July that it will hold joint exercises with Russian forces in the South China Sea. The air and sea drills are expected to occur sometime in September and aim to strengthen cooperation between the two countries and boost their capacity to respond to maritime threats. A Chinese spokesman for the Defence Ministry said that the drills aren’t directed against any third party. Russia has been a vocal supporter  of China’s stance on the international arbitration case in The Hague, and has argued that countries without a direct claim should remain impartial. M. Taylor Fravel, an associate professor at MIT, told The New York Times  that the exercises’ impact would depend on where in the South China Sea they occur—if they were held near the disputed Spratly Islands, China’s neighbours would likely be alarmed. A British Ministry of Defence spokesperson has confirmed  that the Royal Navy’s entire fleet of Type-45 Destroyers are currently docked in Portsmouth and aren’t in operation. The spokesperson told Sky News that the six destroyers were docked because they had just returned from operations, were variously about to deployed, were conducting training or carrying out maintenance, or were home for their crews to take summer leave. Another senior figure in the Defence Ministry said the situation  was ‘almost unprecedented’ and that it ‘either showed a gross lack of planning or was indicative of something more serious’. 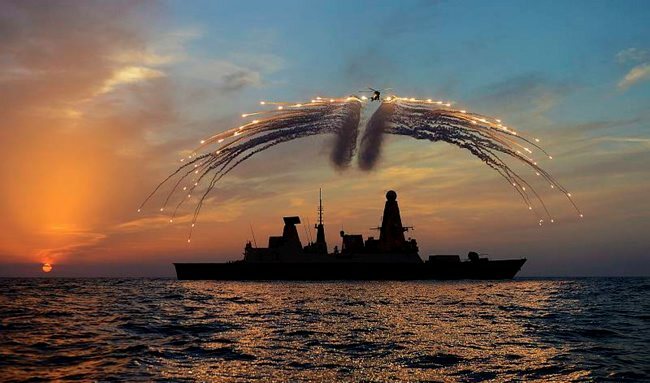 The ships are considered essential  to the Royal Navy’s war-fighting capability, and are the most powerful ships ever built for the British Armed Forces. This is the latest embarrassment for the £6 billion fleet—significant engineering issues mean that all six vessels will need new engines  in coming years. The USAF’s first F-35 squadron has completed all the necessary preparation to be declared combat capable and Defense News has reported  that initial operating capability (IOC) could be declared as early as next week. The news comes the week after the gun pod intended for the B and C variants was test fired on the aircraft for the first time, the footage of which is now available . A recent piece from The Warzone looks at the stats for the GAU-22 , which has 220 rounds of 25mm ammunition and fires at a rate of 3,000 rounds per minute, comparing it to the firepower of the GAU-12 used on the AV-8B Harrier and the GAU-8 on the A-10. As the F-35A creeps closer to its IOC milestone, Vice News reported  that Canada may abandon its plan to order 65 F-35s for cheaper, out-of-the-box jets—a move that would increase costs for other customers, including Australia. The ongoing debate over the future of close air support (CAS) systems livened up again this week, with people having plenty to say on the topic. USAF officials last week briefed industry stakeholders on the possibility of procuring two aircraft to meet CAS requirements —but Air Force Secretary Deborah Lee James claims she hasn’t been briefed on the options  and doesn’t know where the funding would come from. At least one pundit has suggested that the A-10 needs to be retired  and the USAF should buy a new ‘Warthog-lite’ in the interim while developing a real replacement. Over at War on the Rocks, this piece  argues that comparing the CAS roles of the F-35 and A-10 creates a false choice as the USAF needs both. For the first time in a decade, Germany last month released its ‘White Book ’—the policy framework for its Defense Ministry. The document asserted that Germany will increase its role in international security policy, and outlined the country’s ambitions  to step up efforts to uphold the international order. Interestingly, the document strongly confirmed Germany’s devotion to NATO, despite its foreign minister recently criticising the organisation for ‘sabre-rattling’ . Robust statements of German resolve will offer relief to NATO states, given that US presidential hopeful Donald Trump indicated last week  that, if elected, he wouldn’t defend NATO allies that hadn’t fulfilled their financial obligations. In 2014, NATO members pledged to spend at least 2%  of GDP on defence by 2024. To get the lowdown on how that goal is progressing, Defence One has published two charts  showing the current defence spending by NATO members—as it stands, only the US, Greece, the UK, Estonia and Poland reached the 2% target in 2015 and are projected to do so again in 2016. Now for something completely different: Russia’s International Army Games  began on Saturday . A cross between a military recruitment showcase and the Olympics, the spectacle features more than 3,000 military personnel from Russia and 19 other nations engaging in military drills and a variety of sports. Dating back to the Soviet era, the games have been subject to controversy with the US and several other NATO members declining to take  part this year.